Occupational therapy was the very first intervention (along with speech therapy) that the pediatrician ordered when Dominic regressed 7+ years ago. We did it until he turned 7 and then had to stop until last fall because my health insurance stopped paying for any treatment related to a diagnosis of autism the day he turned 7. Last fall we finally got on the medicaid waiver that has paid for OT and ST since. Dominic's current OT goals are primarily around strengthening his hands and working on his fine motor skills so that he can write, tie his shoes, trim his fingernails, etc. There is a hefty component of sensory activities. 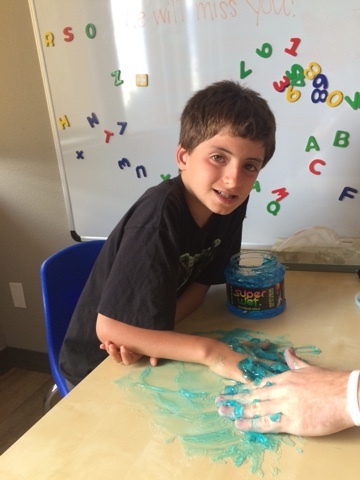 Friday, Dominic worked with a newer therapist who is doing his internship under our primary OT. He's young, fresh out of school and taking to OT like a duck in water. As a rule, Dominic has always done really well with male therapists which is both awesome and hard because the field is primarily female. So they did handwriting, using blue hair gel. Because what else would you use blue hair gel for? 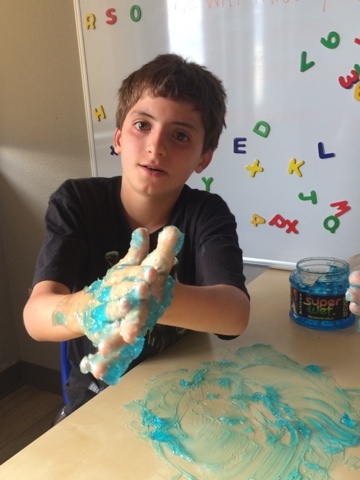 This is the child who 6 months ago begged to wash his hands when we dipped one finger into the fingerpaint - he couldn't handle the sensory feeling of goopiness. Thats huge progress right there. After the therapy session, the intern OT came out to visit with me for a bit. After my first statement to him, which was "Don't vaccinate your children", I explained in great detail how he is going to be front line. Every pediatrician starts with OT before a diagnosis. He will be in the role to let parents know how important getting toxins out of the diet are. I told him how the first person who suggested GFCF to us was that very first OT 7 years ago and how it took me a solid year to do it because I was so intimidated at the thought of no bread/pasta/etc. I explained how gluten and casien proteins break down into opioids in the system and how our children are basically stoned on their food. I made that point that they have much more of a chance to learn from therapy when they aren't stoned out of their minds. I think I blew his mind. I know I certainly made an impression. He repeatedly told me I was amazing. But I'm really not - The alternative to being an involved advocate, working with Dominic at home, trying everything I can possibly find is doing nothing. And doing nothing is completely unacceptable. Do not be afraid to speak your truth and tell your story to therapists, especially ones straight out of school. These front line therapists are the ones who will carry that truth to the new parents who walk into their office. This is how we win the war - by teaching this new generation of therapists what to do with our kids.